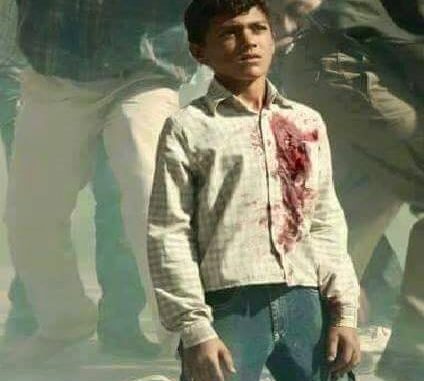 Pada tanggal 1 Desember 2015 (pukul 21.23) akun ‘Irvan’ memposting sebuah gambar seorang anak dan diberi deskripsi sebagai Anak Palestina yang ditembak oleh Tentara Israel. Ya benar, tetapi diperankan oleh aktor dan aktris berpengalaman. Agar tidak menjadi misinformasi, untuk kita ketahui bersama bahwa gambar tersebut merupakan cuplikan dari sebuah film berjudul ‘Mamlakat al-Naml’ atau lebih dikenal ‘The Kingdom of Ants’. Diputar sejak tahun 2010 di berbagai negara, seperti Tunisia, mesir, dan Suriah. Namun karena banyaknya peristiwa di berbagai negara, sehingga film ini berhenti perputarannya untuk internasional dan diputar kembali pada tahun 2012 untuk kelas internasional. “Palestinians have deep-rooted traditions. Although they have not yet been able to beat their oppressors, they have not yet learned the philosophy of defeat. Their enemy saw this in them and director Chawki al-Mejri wanted to show it to the entire world. Mamlakat al-Naml (The Kingdom of Ants), coming soon to Lebanese theaters, is a poetic portrayal of Palestine in cinema. The film does not document the Palestinian struggle. Rather, it weaves legends that touch the heart and not the mind. The film is about struggle that passes from generation to generation. It is about early death that forces parents to bury their children, breaking the natural order of life. It is the tapestry of a cause, from one intifada to another. Mamlakat al-Naml is about a family struggling to survive on land being carved up piece by piece and a dream that is crushed night after night. The struggle is the family’s heirloom, just like ants inherit the daily scramble for means of survival. A father puts his life in the hands of the resistance, being chased and apprehended regularly. He offers his son to the intifada, while the mother surrenders to her fate. The grandfather lives in the graves, collecting the bones of his comrades that keep him company in an underground kingdom. The film falls into exaggeration. It is full of fables of infinite heroism, where the family has no life outside the struggle. It does not explore the details of daily life, which are present in every society, even the Palestinians’. n a shot that wanted to be symbolic, a dying child smiles to his friend, but the scene looks like a caricature. The affected manner of the film begins with its script and continues to its characters and cinematography. It is also full of errors. There is no logic in the sequence of events and the muddled plot is full of digressions that exhaust the viewer. Dengan tidak mengurangi rasa simpati dan kesedihan kami terhadap saudara kita di Palestina, kami imbau para pengguna internet, bahwa klaim tidak berdasar untuk memotivasi orang-orang itu sangat tidak dianjurkan, terlebih jika itu terbukti fitnah dan tidak dapat dipertanggungjawabkan kebenarannya. Tetap waspada informasi yang tidak akurat dengan maksud propaganda dan memiliki tujuan jahat terhadap pengguna internet. Stop Memotivasi Dengan Cara Hoax. Semoga bermanfaat, sikapi dengan bijak, salam internet sehat!